Learn what is RAM and ROM in your smartphone. To check the RAM and ROM on your realme smartphone, go to [Settings] > [About Phone]. Random-access memory, or RAM, is a form of phone data storage that stores data and apps currently being used. RAM can be read and written randomly at any time, in any order and from any physical location, and will release the data put on it when the phone is turned off. When you run apps, all the live running processes run on RAM. If you run multiple apps at the same time, you might face the insufficient RAM issue. Therefore, clear your RAM often is recommended to get a smoother experience. Read-only memory, or ROM, is a form of data storage in your phone that cannot be easily altered or reprogrammed. 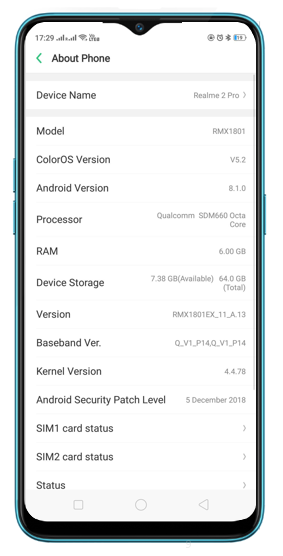 Your phone's internal storage (the space you get by default on a phone to storage media and files) is a portion of ROM, and your ColorOS and preinstalled apps also reside here. ROM is non-volatile. Its contents are retained even when the phone is turned off.